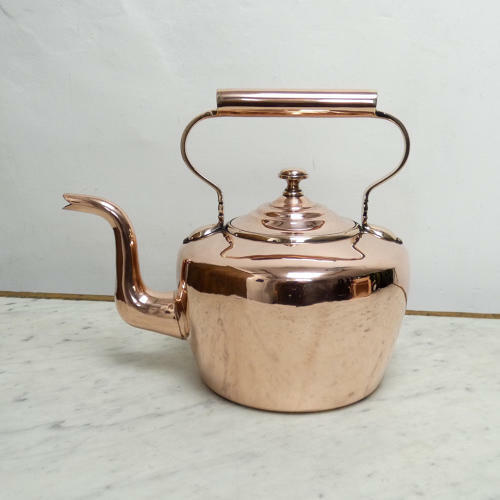 An Impressive, large, early Victorian copper kettle. This kettle is English and it dates from c.1840. There is an impressed, star shaped mark to the base. It is well made, from a heavy gauge of copper, and it has castellated seams around the base and up the side. It is a lovely, slightly squat shape, and it has a brass rim, brass fittings to the handle and a plain, mushroom shaped, brass finial to the lid. It is in excellent condition and the tinning, to the interior, is still good enough for it to be used. Price includes postage within the U.K. Shipping to the U.S.A. add £35. Western Europe add £15.